Elecnor Smart Cities - Every day. In your city. With you. Elecnor is one of the leading global players in engineering, construction and development of infrastructure projects. It is also a leading developer and investor in the fields of renewable energies, energy and environmental infrastructure and space. With over 50 years of continuous growth, a presence in more than 50 countries and over 13,000 employees worldwide, Elecnor has become one of the most prominent Spanish business groups and a benchmark in the infrastructure, renewable energies and new technologies sectors. Cities are progressing and growing, generating a huge volume of information which must be processed in order to meet present and future challenges. The use of information and communication technologies brings solutions and services that foster innovation and achieve more efficient and sustainable cities, increasing the life quality of residents and using available resources more effectively. Efficient management is one of the key aspects on which Elecnor has focused its high capacity for innovation, helping cities and companies to be more efficient, fostering energy saving and reducing consumption. As an Energy Services Company, Elecnor develops bespoke end-to-end and turnkey projects to improve the energy management and maintenance of companies and local authorities. Building a smart city requires prior analysis so that we can ascertain our starting point, determine the improvements that can be achieved and establish an appropriate model for each city and its residents. At Elecnor, we accompany our customers throughout the process. We advise them on the strategy to follow and on the design of a bespoke smart model, optimising investment and resources. Our goal is to provide the best technological and innovative solutions in order to obtain a smart, sustainable and efficient city. 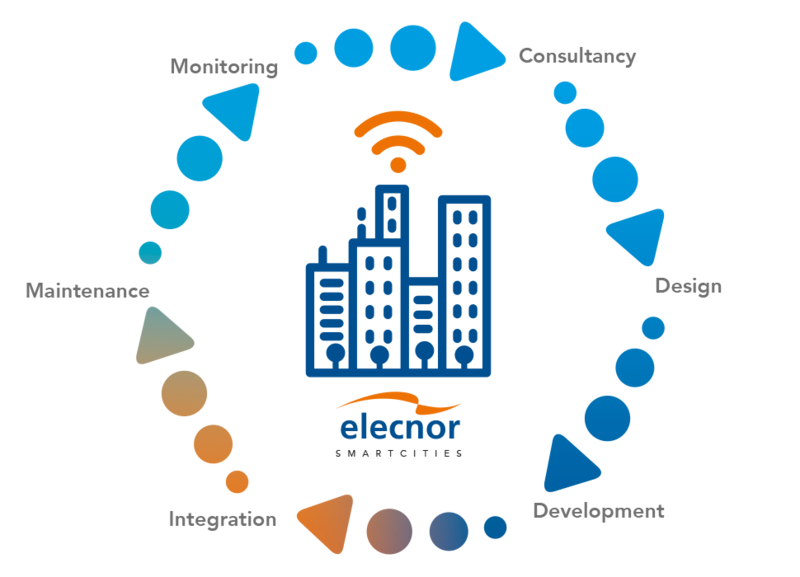 In the sphere of smart cities, Elecnor is positioned as a local partner with a global mindset. The company leads the way in technology and innovation and has the necessary skills and resources to deliver excellence in all the areas that drive the development of a smart city. Management of the treatment and purification network. We're here to advise you. Tell us about your requirements at smartcities@elecnor.com and we'll get to work on your smart city. © 2018 ELECNOR. All rights reserved.